How: By understanding what it takes to start my ball on the intended line and get my 1st putt to finish within 3 ft of the hole. Your setup will influence the path of your putter. The setup includes your grip, your eye position, your balance, your ball position, your posture and much more. You can learn good speed with a little bit of practice. The length of your stroke and the tempo of your forward stroke will determine how far your ball will go. For the 1st 10 ft your putter will go back approximately 8” and then for every 10 ft beyond that the putter goes back 4” per 10 ft. On downhill putts and fast greens the forward stroke will slow down as the ball needs to roll slower therefore the uphill putts will require more forward stroke tempo to get the ball to go the correct distance. A clear, focused routine will allow you to hit more good putts. 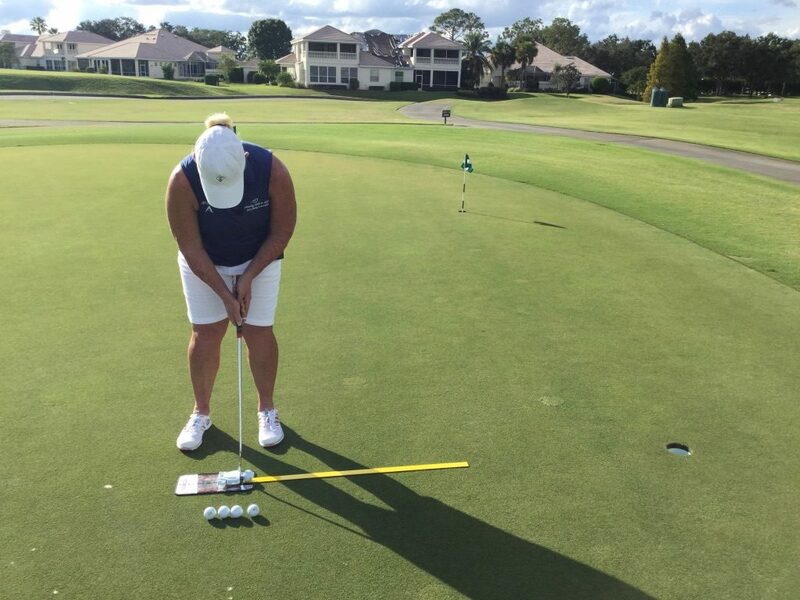 You can build confidence in your putting by practicing the things that are important for you, not everybody needs the same prescription! Green reading can be done by feeling the slope with your feet. Should you want to become great at this- you and I will need to discuss AimPoint and a plan to accomplish this together. Putting Mirror – This will help you improve your set up, eye position, balance and ball position. It will also help you to be consistent in your set up so its easier on the course. AimPoint Distance Control Matt -10, 20, 30 ft – this will help you get your ball within 3 ft of the hole and then lead to more 2 putts! AimPointer Training Aid – this will help you learn to Aim your putter on your intended line. You may recall we talked about types of different putters and making sure you had the right putter in our clinic. I told you would could make some time to see about getting fitted for a putter and getting off on the right path to being a great putter. If you would like to explore getting that help Please Click Here to set up a time to chat about your putting plan and needs. I would also strongly encourage 4 of you that want to REALLY get better to coordinate and schedule a 4 person clinic here. We can accomplish a lot- QUICKLY- in that smaller class. I also wanted to include a link to all of my available instruction and clinics should you want to explore more.